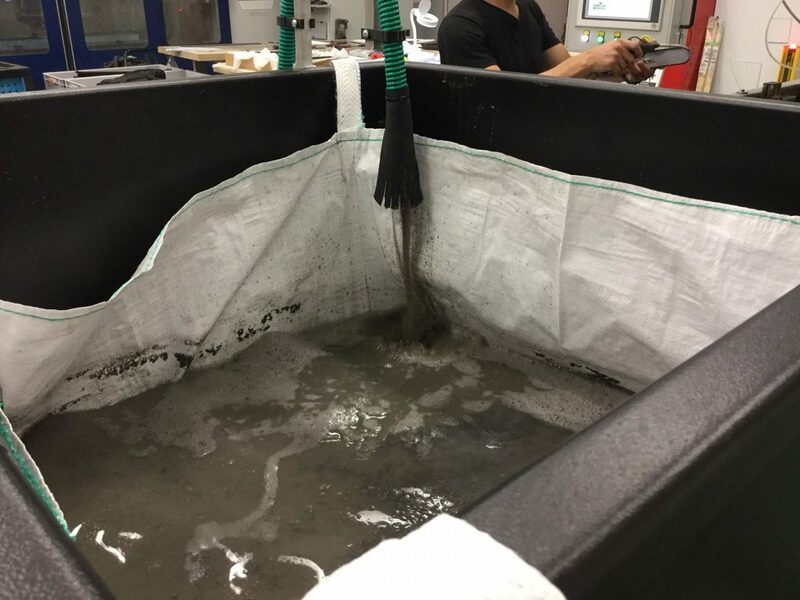 In waterjet production, sludge (sand/abrasive) is deposited in the cutting basin, which means that it very often requires extensive cleaning. In addition, the water is contaminated with pollutants – but legal standards prescribe what may be discharged into the drain. 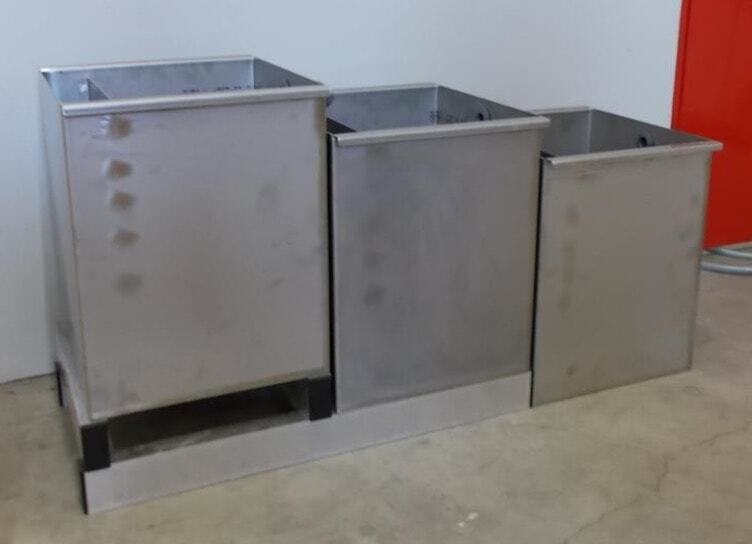 With the products of our Woda series, we support you in meeting legal and ecological requirements on the one hand, and in saving working time in cleaning the collection basins on the other. With the mobile manual desludging system WodaGarnetClean you transport abrasive sludge from any waterjet cutting system quickly and easily. 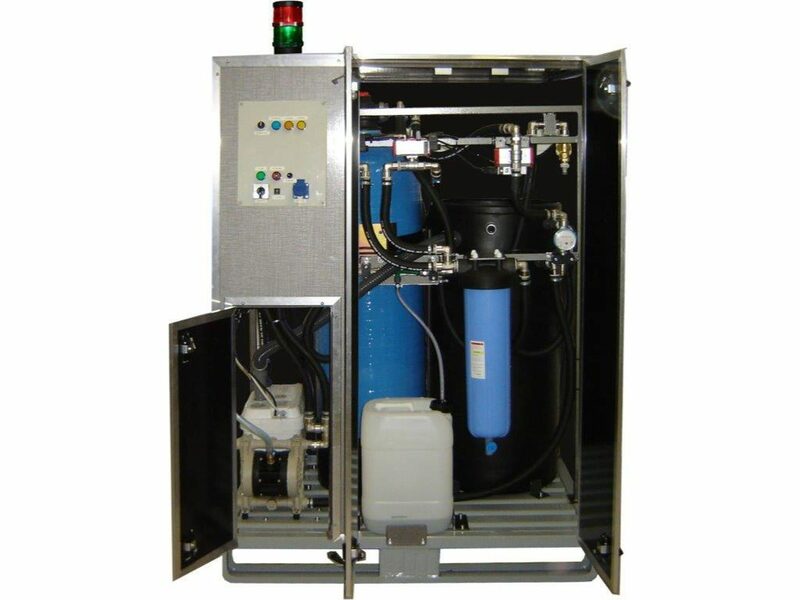 The system requires only compressed air (2-6 bar) and can be used variably where it is needed. With the aid of the suction lance, water is pumped into the deposited sand to stir up the hardened mass. The water-sand mixture is then aspirated and pumped into the collecting tank. Sand and coarse suspended solids are deposited in the suspended filter fabric bag (can be ordered from corrugator). The water can be pumped back into the water tank and the filled fabric bag can be removed with a forklift. With WodaGarnetClean between 3-4m³ water per hour can be conveyed and thus up to 1t of abrasive per hour can be filtered out. A container with e.g. 4x2m can be cleaned in approx. 3h. With the aid of WodaSettlingTank, suspended solids (sand, abrasive) can be separated from the water before it enters the drain. Due to the special guidance and flow of the water in the 3-stage tanks, the substances settle in the stainless steel tanks. After filtering sand, WodaWaste enables the filtration of light suspended solids and heavy metals. This means that the water can enter the wastewater without the use of harmful chemicals.